UPDATE May 8, 2012: Want to see the real photo of the TS-990S? Check out this post. The image above has been floating around the Internet for a couple of months as the concept for the Kenwood TS-990S. Is it the real thing? No. Absolutely not. It is, without a doubt, a Photoshopped image. I ran an image error level analysis to see what parts were Photoshopped–see results below and follow this link to the full anaysis. This analysis shows where Photoshop cuts and pastes were made--notice the areas highlighted in pink. This entry was posted in Announcements, News and tagged Kenwood, Kenwood TS-990S, Kenwood TS-990S photo image, TS-990S. Bookmark the permalink. 1 Response to First photo of the Kenwood TS-990S? The TS-990 picture appears to be a composite of the TS-950SDX front panel (sample: http://ve3hg.files.wordpress.com/2010/11/ts950sdx.jpg), with the display of the TS-590 (example: http://www.rffun.com/catalog/hamhf/0590lrg.jpg) dropped in, with background color changed to match the TS-2000. 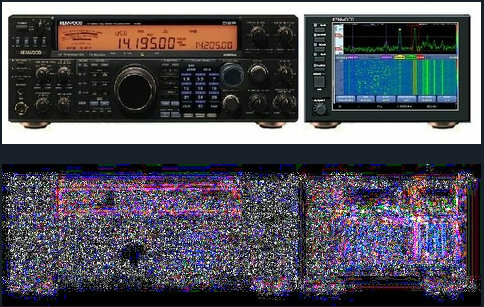 The image of the spectrum display unit may well have begun life as a picture of the Elecraft P3 (http://www.elecraft.com/P3/p3.htm), mirrored, and other pieces dropped in. Note that the dark gray shades of the front panels of the two units don’t match.